You'll be pleased to learn that despite the Icelandic ash cloud our 18 strong group got through to the Continent and spent a lovely sunny weekend visiting the Berliner Fechtclub. After ferocious fighting the team tournament was won by Lucy (as Gretel) and Jon (Hansel) while Olivier took the respectable 3rd in the sabre event. 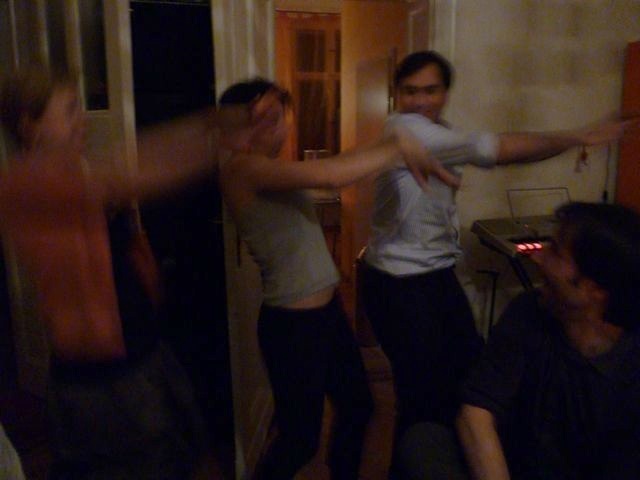 Other highlights of the trip included international karaoke, plenty of beer, belly dancing performance by Umut, Christel and Alisa, neighbors knocking on the door and asking to stop the karaoke, wurst und kartoffeln meal at the local brewery, visits to the DDR museum and posing on a US army vehicle while wearing conductive lame jackets. We usually manage two trips a year, so if you're interested to join next time, book your holidays in advance. Athen's trip is scheduled for October 2010 and for the Spring 2011 it'll be either Budapest, St.Petersburg or Tokio! With a smile on our faces we are looking forward to the next round...Many Thanks to my Team members Antoine and Coen! Anyone who is interested to have a go in one of the forthcoming competitions is encouraged to check the BFA competitions calendar and then talk to fellow members with a view of going together. 15 May, Saturday - No fencing at Finsbury Leisure centre due to event in the basement hall. Our agreement with the leisure centre is that occasionally they might request use of the basement hall for their functions. I think this happens for the first time in the last year. My apologies for the cancellation. Please feel free to come to any other session instead. 4 June, Friday, 7.30 pm till late - Elaine's and Christel's 40th birthday party at Spring Studios. The brief: It’s our “F'ing Fortieth“ party. An 'F' word theme. Bring your pet Ferret, bedeck yourself in Faux Fur or bake French Fancies, whatever 'F' takes your Fancy. More details here. 10 July, Saturday, 11 am - 5 pm: the Club Championships. All weapons. More details to follow but put in your diary and start training now! The dramatic metamorphosis of Werner's electric sabre mask from size L into size M while he was looking away or maybe left the piste to answer a call of nature highlightens the issue of the unidentified kit. You might think that your masks (glove, socks, epee) have a face of their own but other people may not notice this and by mistake carry them away as theirs. The moral of this tale is simple: please sign your name on your kit. And give Werner his mask back if your took it by mistake on 24 Feb 2010. 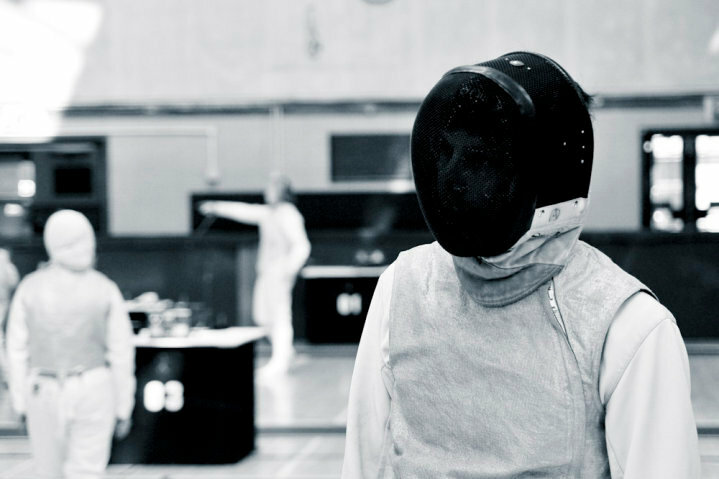 Remember, you're interested in fencing, not just beach volleyball! Take a look at the eerie world of Eadweard Muybridge, the pioneering 19th-century photographer whose studies in motion laid the ground for the birth of cinema. Muybridge will be celebrated in a major retrospective – his first in the UK – at Tate Britain in September.